One of my favorite ways to prepare delicata squash is by slicing it in half lengthwise, scooping out the seeds and roasting it until tender. It becomes the perfect vehicle for stuffing with any of your favorite veggies, grains, beans or meat. I kept things simple here with Christmas in mind because this recipe is a lovely side dish to bring to any holiday gathering. It’s sweet, buttery and festive to boot! Also- the pumpkin seeds in this recipe are store bought (gasp!) but roasting your own is the way to go. If you’re not in a pinch for time follow this method for a tasty snack and garnish. Otherwise, store-bough is just fine. We’ve always got a stash just in case! Preheat the oven to 425F. Place the squash cavity side up in a roasting pan. Mix together the butter, mustard and honey in a small bowl. Evenly fill each squash cavity with a spoonful of the butter mixture. Season with salt and pepper and bake in the oven until the squash is tender, about 25-35 minutes. Depending on the size of your squash start checking after 20 minutes. While the squash bakes toast the pumpkin seeds in a small dry skillet over medium heat until lightly browned on all sides, about 3-5 minutes. 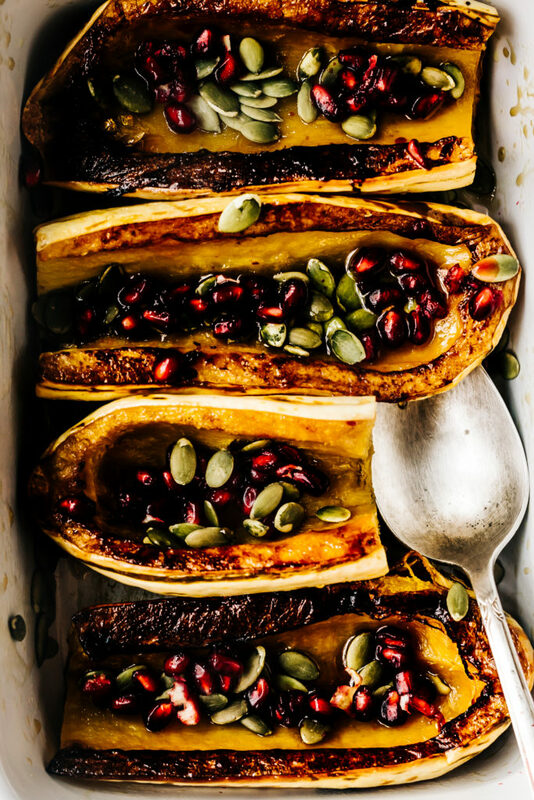 Serve the squash with the toasted pumpkin seeds and pomegranate seeds warm or at room temperature. I’m a little confused. In your text you say to scoop out the flesh which struck me as odd, but the recipe says to scoop out the stringy membrane. Hi Rita, The flesh/stringy membrane is the same thing. I’ll update that in the recipe but it’s just the “stringy part of the flesh” that needs scooped out. Does that make sense? Delicata squash is my favorite of the winter squashes and I tend to make it the same way each time. I’m so happy to have another recipe! Side note: We are moving to Portland next year. How far is you CSA pickup from there?